Long evening shadows almost blot out the colours of the flower garden, planted by John Constable’s mother. Painted in 1815, it is one of two paintings that remain the artist’s most personal works, and which he kept with him all his life. The twin paintings show the flower and kitchen garden belonging to Constable’s father Golding and mother Ann, at the grand house in East Bergholt, Suffolk, which his father built in 1784. Constable was born there in 1776, and his earliest sketches include scenes of the house, garden and surrounding farmland – including the oldest drawing Roodhouse has traced, which shows an overgrown patch of weeds and brambles. “This place was the origin of my fame” Constable once wrote. In February 1815, Ann fell while weeding. Constable’s brother Abram wrote to him: “My mother was attack’d yesterday morning whilst in the garden with giddiness, brought on by the cold which was very severe and stooping to weed.” By the end of March she was dead, aged just 67. Constable missed her funeral, although Roodhouse, who has been poring over archives in the UK and America, has not found an explanation for his absence. Instead he came for a long summer stay, but when he painted the gardens in July his father was ill. Golding died the following year. Soon afterwards, the family home was sold, and then demolished along with its gardens in 1839. 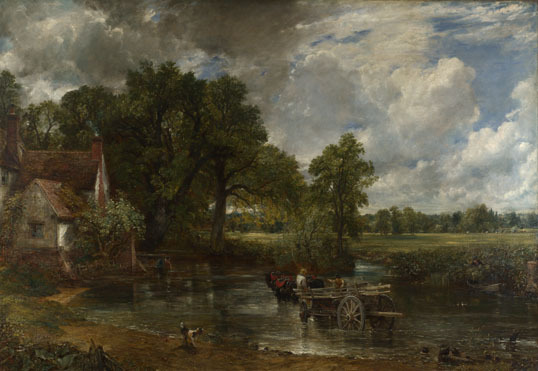 The link was broken between Constable and the landscape which had inspired many of his most famous paintings, including The Hay Wain. Christchurch Mansion has owned the two garden paintings since 1955, and has the best Constable collection outside London. In 2013, along with the Tate and others, it launched a successful appeal to acquire one of his most spectacular paintings, Salisbury Cathedral from the Meadows, which is also on display. Roodhouse has borrowed work from the Tate, the V&A and the Fitzwilliam in Cambridge – including another shadowed garden belonging to Constable’s friend John Fisher in Salisbury. Alongside these works, which offer us a glimpse into Constable’s childhood, is a rare example of the work of the artist as a juvenile delinquent – a carving of a windmill, which Constable gouged with a penknife into a piece of timber from his father’s mill.